that Jupiter, Venus, and even Saturn were visible between the clouds. The clouds were rapidly filling in the sky and there was not enough time to setup the scope, but I did grab the camera and tripod and snapped a quick few images of Jupiter. My sense was that the images were not going to be very good and I had just a few minutes before the clouds again covered everything up. Wow, what to do? Help! Can anybody remind us what it is like to look through a telescope? Should we consider taking up the study of meteorology instead of astrophysics and astronomy? At least the meteorologists can always look up and report whatever they see and can predict and all is fine. No, that is not for me. Should we do another post of some neat astrophysics type stuff? I was considering what to do and resident astronomer, Peggy, reminded me that going into another astrophysics session might be too much. Ok, ok, the interesting physics of momentum transfer and torque generation of planetary migration might be too much, in fact I'm still struggling to understand how it works. (4). Previously, I recommended Mike Brown's course on The a Science of the Solar System from Caltech, but this course will finish next week. You maybe can still view all the lectures if you're interested. So this Memorial Day weekend comes to a close without many viewing opportunities. We did have a chance to finally see the movie "American Sniper". I don't know why we were too busy to see it when the movie first came out, but seeing it this weekend was very good timing. It was fantastic and fit together with the holiday theme. We even attended a very moving VFW ceremony by the ocean in Dana Point honoring the soldiers who gave so much for our freedom. Driving by the ocean is fun too. Maybe studying oceanography is another option; it's always visible. Or maybe just studying life on the beach while sipping a martini? Oh well, so that is it for this week, except for one of the quick images of Jupiter that I mentioned earlier. Saturn is about half the angular size of Jupiter and about 6 times dimmer and was fading into the clouds The Jupiter image pasted below was taken with a 300 mm telephoto on tripod and was made with a long exposure so that if any faint moons were in view they would be visible. The image of Jupiter is overexposed, but at least one moon is visible. So, you can see you don't really need a telescope to get at least a fuzzy image of the planets, but the detail from the scope with focal lengths of 900-2000 mm and good tracking to compensate for Earth's rotation can be much better. I think I've had enough of this Gray May weather and look forward to June Gloom or at least clearer skies. 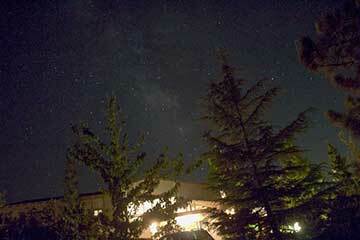 Unless, you're trying to get images of large constellations, a camera without the scope is just not the same.